Are the robots going to steal your job or just free you up to tackle other needs at work? It’s a consideration that puts fear in the heart of the typical American employee. You see, on the positive side, labor-saving devices make workers more productive. And having more productive workers typically means goods cost less, a fact that allows consumers to build up their savings accounts. But amid that increasing productivity, labor-saving devices cause labor market upheaval, which has both positive and negative externalities. The growth of green technology, solar technology in particular, has primed solar photovoltaic installers and wind turbine service technicians to be the two fastest-growing jobs over the next 10 years, according to Bureau of Labor Statistics (BLS) estimates. On the other hand, the BLS projects occupations like typists and watch repairers will decline dramatically as technology advances. More concerning than just the loss of specific jobs is how densely packed those occupations susceptible to automation are in certain states. A high concentration of those jobs in your neck of the woods could portend a crisis in your local economy. Below we look at BLS data and other research to determine the states where jobs are most vulnerable to automation. In order to rank the states most vulnerable to automation, we looked at two factors. We looked at the number of people working in different occupations and examined the risk of automation in each occupation. To see where we got our data and how we put it together to create our final rankings, check out our data and methodology section below. The South faces trouble – According to our data, the Southern states in the U.S. face the most potential job loss as a result of automation. Along with the South three states in the Great Plains also crack the top 10. Mix of jobs at risk – The occupations facing the largest risk of automation are telemarketers, title examiners, abstractors and searchers, hand sewers and insurance underwriters. Each of those jobs faces about a 99% chance of being automated in the near future. However, these jobs don’t tend to employ a lot of people. Retail salespeople (92% risk of automation), cashiers (97% risk of automation) and fast food preparation and serving workers (92% risk of automation) are the jobs with large employment figures and high risk of automation. Nevada takes the top spot. We estimate that nearly three in five jobs here are at risk of automation. In total job terms, that is about 766,100 out of 1,295,000. In particular, retail salespeople face the largest risk of automation at 92%. Nevada is not unique in that its waiters, cashiers and fast food employees make up a large of chunk of the state’s vulnerable workers. But Nevada is distinct in the dominance of the gambling and hotel industry in the state’s economy. There are more than 63,000 people working as either gaming dealers, maids or bartenders, all of whom face a greater than 65% chance of being automated. According to our estimates, just over 58% of jobs are at risk in South Dakota. Like in Nevada, retail salesperson is the job with the largest potential job loss. In total, there are 16,100 retail sales people in South Dakota, and our data shows this occupation faces a 92% chance of automation. South Dakota also contains a large number of trailer truck drivers and freight stock and material movers, two jobs with significant risk of automation. In total, the jobs at risk equal nearly $8 billion worth of income. Just to the west of South Dakota is Wyoming, the third-ranked state. This state fell just short of South Dakota, with 56.4% of jobs at risk of automation. Once again, retail salespeople are the most at-risk occupation here. In total, there are 8,200 retail salespeople. Other notable occupations that face a high chance of automation include trailer truck drivers and construction equipment operators. Between those two occupations, about 8,900 jobs are at risk of automation. Louisiana comes in fourth. We estimate that roughly 1,048,000 jobs are at risk of automation here. That’s roughly 56% of the 1,874,680 jobs we analyzed. The occupation with the most jobs at risk is cashiers. There are 70,510 cashiers in Louisiana and our research estimates cashiers have a 97% chance of being automated in the future. Cashiers are one example of an occupation where the average person can see the change before their very eyes. Self-checkout machines in pharmacies and supermarkets have become increasingly prevalent over the past few years. Coming in fifth is Montana. We estimate that about 251,300 of the nearly 454,000 jobs we analyzed are at risk of automation in Big Sky Country. Like other states, Montana has a large number of residents employed as retail salespeople, cashiers and general office clerks, all jobs with a greater than 90% chance of being automated. Occupations that are prevalent in Montana and have a low chance of being automated are general and operations managers, first-line supervisors of construction trades and electricians. More than 10,000 people are employed among these three trades. Each of these occupations has a less than 20% chance of being automated. Another Southern state comes in sixth. 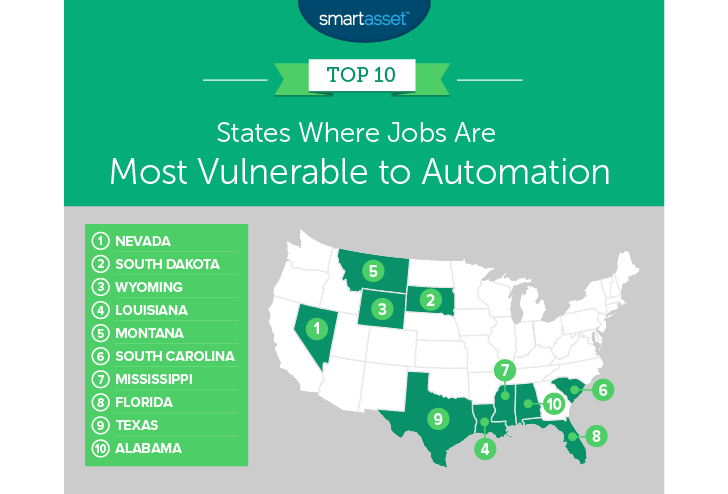 Just over 1.1 million jobs are at risk of automation in the Palmetto State, according to our research. That leaves just over 55% of jobs at risk, based on BLS data. Two jobs that are at a low risk of automation here are general and operations managers and police officers. Between those two jobs alone, about 44,000 people are employed. Mississippi comes in seventh. This state has large numbers of retail salespeople, cashiers and hand laborers and material movers, three jobs that face a high risk of automation. Those three occupations alone employ nearly 100,000 people. In total, we estimate just over 55% of jobs in South Carolina face risk of automation. One of the largest states in the union, Florida also faces severe risk of automation. We estimate that about 4.6 million of the roughly 8.4 million jobs in Florida are at risk of being automated. That translates to almost exactly 55%. If you multiply those jobs by their average annual income, that equals nearly $158 billion in annual income lost. Workers at risk of automation may want to look into becoming police officers, licensed vocational nurses or childcare workers. Those three jobs are plentiful in Florida and face a less than 10% chance of being automated, according to our research. The state with the second-most workers in the country is also the state with the ninth-largest percent of jobs at risk of automation. The top-three occupations with the most jobs at risk are retail salesperson, fast food preparers and general office clerks. In just those three occupations, a million jobs are at risk of automation. We estimate automation will result in the loss of nearly $239 billion in income for those workers. Our list ends in another Southern state: Alabama. Our estimates suggest that just under 55% of jobs in Alabama are at risk of automation. In terms of size, the job loss risk from automation does not quite reach the levels we see in Texas or Florida. Just over 1.05 million jobs are at risk of automation in Alabama, compared to 4.6 million jobs in Florida and 6.5 million job in Texas. Total workers in occupations. This is the total number of workers in occupations we had data for. Data comes from the Bureau of Labor Statistics and is from 2017. Susceptibility of jobs to automation. This is the percent chance an occupation will become automated over an unspecified number of years. Researchers say a decade or two is an appropriate timeline. Data comes from research done at Oxford University. Specifically, “The Future of Employment: How susceptible are jobs to computerization?” by Carl B. Frey and Michael A. Osborne. We multiplied the number of jobs in each occupation by the chance they will be automated for each state. The state with the highest percent of jobs at risk of being automated scored first, while the state with the lowest percent of jobs at risk of automation scored last. Start early – Your best bet to secure high returns on the market is to invest early. If you invest early, you can ride the highs and lows the market inevitably brings without having to worry about timing. By investing early you can also take advantage of compound interest. Make the most of your investments with an expert – There is so much to consider when investing, such as the tax implications of selling off your assets. So instead of stressing about whether you’re making the right move, why not hire an expert to work with you? If you are not sure where to find a financial advisor, check out SmartAsset’s financial advisor matching tool. It will match you with up to three local financial advisors who fit your investing needs.